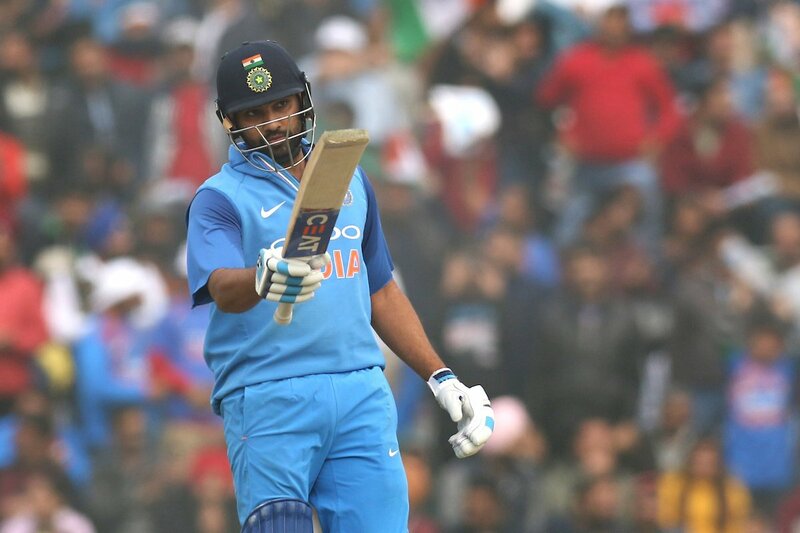 Dubai, Dec 18: India opener Rohit Sharma has climbed to the fifth spot amongst batsmen in the latest International Cricket Council (ICC) One-Day International (ODI) player rankings released here on Monday. The right-handed batsman has gained two slots and crossed the 800-point mark for the first time after leading India to a 2-1 ODI series victory against Sri Lanka, according to a release by the ICC. The 30-year-old had earlier enjoyed a career-high ranking of being on the third spot in February. He reached a personal high of 825 points after the second match in Mohali when he struck an unbeaten 208 to record his third ODI double-century. He ended the series with 816 points. Rohit's opening partner Shikhar Dhawan, who was named player of the series, too has gained one slot to reach 14th position after aggregating 168 runs including an unbeaten 100 in Visakhapatnam. Dhawan had slammed 68 in the second match, figuring in a 115-run opening stand with Sharma. Among the bowlers, leg-spinner Yuzvendra Chahal has moved up 23 places to take 28th place after finishing with six wickets in the series. Chinaman Kuldeep Yadav has moved up 16 places to take a career-best 56th slot while all-rounder Hardik Pandya has gained 10 slots to also reach a career-best 45th position. For the visiting side, Upul Tharanga has gained 15 places to reach 36th position among batsmen with his current tally of 571 points his highest in five years. Niroshan Dickwella has gained seven places to take 37th position. Pacer Suranga Lakmal (up 14 places to 22nd) and all-rounder Angelo Mathews (up nine places to 45th) have moved up in the list for bowlers. However, there has been no change of positions in the ICC ODI Team Rankings.